With the approval of its schematic design this past month, Tech’s Living Building has moved one step closer to reality. It now launches into its design development stage, where the schematic design will be fleshed out into a full-featured design and where developers will determine how all of the systems and technology of the Living Building will interface with one another. Those engineering implementation details will prove to be critical to the success of the Tech Living Building, whose design adheres to the International Living Future Institute (ILFI) Living Building Challenge, a stringent set of green guidelines centered on not only making buildings safe for the environment but also allowing them to blend in and enhance it. According to the ILFI website, Living Building Challenge guidelines are split among seven “performance categories,” dubbed the “Petals” to evoke the image and symmetry of a flower. These Petals (Place, Water, Energy, Health & Happiness, Materials, Equity and Beauty) and their component “Imperatives” set high standards for how Living Buildings can use local resources while still being adaptable enough to fit multiple climates and environments. The design team for the Living Building here at Tech has been careful to ensure all of the proposed design fit within the Living Building Challenge’s allowances. “When we were going through schematic design, we were monitoring where we were within the spectrum of compliance,” Wertheimer said. “One key feature is the building has to be net-positive energy, which means it has to produce more energy than it consumes. So in order to do that, we’re looking at using a variety of renewable resources, such as photovoltaics and maybe geothermal as well. Furthermore, Wertheimer said that “we have to be net-positive water.” In order to produce more water than it uses, the Living Building will have mechanisms for “harvesting rainwater and building condensation” and use technology like composting toilets, which “hardly use any water at all,” according to Wertheimer. The generated water will then be diverted to “non-potable uses” such as irrigation across campus. The Living Building melds in with the overall campus master plan. 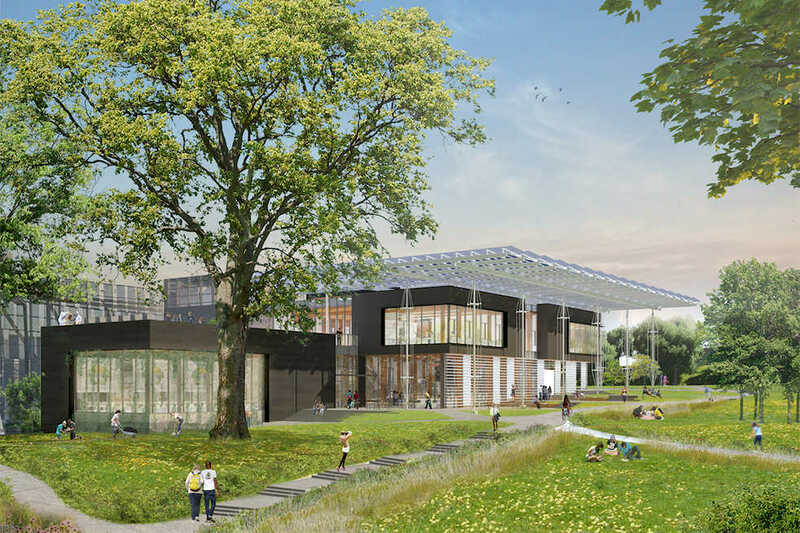 It will directly interface with the Eco-Commons that will connect natural environments across campus with waterways and green space. “There is a western facade on the Living Building that basically will be the front porch to the Eco-Commons from the Living Building, so we’ll have this direct connection between the interior and the exterior and the programmatic experiences between the two,” Wertheimer said. The environmental focus of the Living Building and the Eco-Commons projects opens up several education opportunities in and around the Living Building. “It is our hope that some of the classes that will be taught in the Living Building will be able to leverage what the Eco-Commons has to offer from the pedagogical point of view,” Wertheimer said. An interdisciplinary team of faculty is working on developing potential new curricula and identifying existing classes that could be moved to the Living Building. Wertheimer hopes that the creation of the Living Building will inspire other builders in the Southeast region to consider adhering to Living Building Challenge standards in new building projects, though he admitted it is a challenge. “It’s not simple at all, it’s hard,” Wertheimer said, partly because ILFI requires that constructors avoid all of the 815 chemicals on their “Red List,” some of whose banned chemicals are still commonly found in traditional construction materials. Wertheimer said that avoiding Red List materials in a project as large as Tech’s Living Building could help upset the inertia of the construction industry and encourage manufacturers to move away from using such chemicals. “We want to help transform nationally, but certainly in the Southeast region, where we’re located, so that at Georgia Tech we can use Red-List-free materials in the future,” Wertheimer said.